The plant mediated synthesis of metallic nanoparticles is preferred over chemical and physical methods owing to their easy synthesis, simplicity, eco-friendliness, stability and developed as lucrative field of green nanotechnology. Use of calli in place of other plant organ avoids the mass collection of plant from their wild habitat and offers the synthesis of nanoparticles for all those plants which are critically endangered or are not available throughout the year. 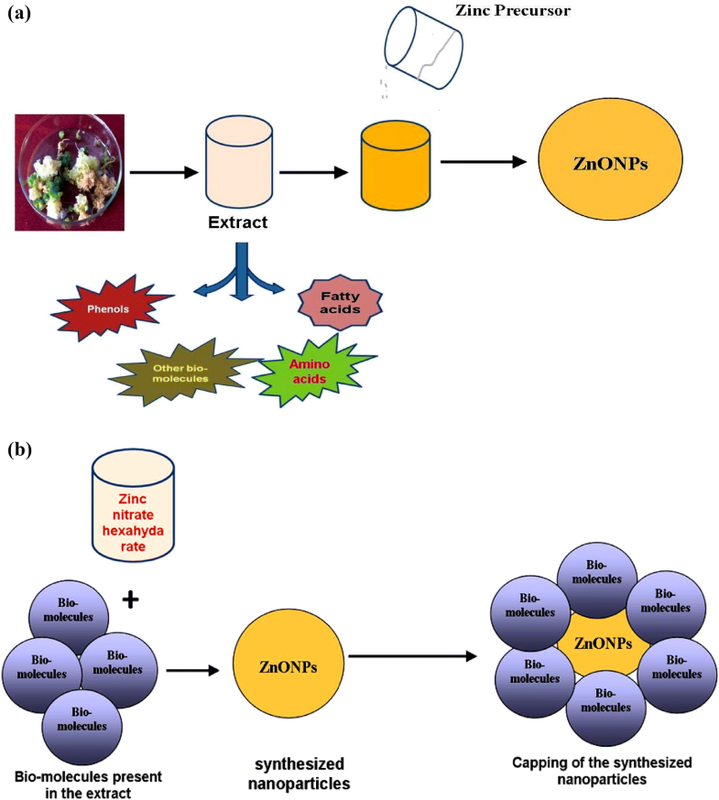 In the present study, an alternative and novel protocol has been developed for the biosynthesis of Zinc Oxide nanoparticles (ZnO NPs) using in vitro culture technique of plant tissue culture as a basic platform for the plant material. Thus the present work aimed to synthesized ZnO NPs using the calli of Viola canescens (Banafsha) and study anti-microbial activity of synthesized nanoparticles. The calli were generated from the leaf and petiole explants, using the auxin (2,4-D and NAA) and cytokinin (Kn). Interaction of callus extract with Zinc nitrate hexahydarate extract for the bio-reduction of Zinc nitrate hexahydarate to its nanoparticles showed potency of calli to reduce Zinc nitrate to its nanosizes. 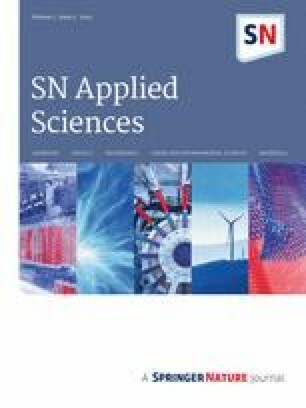 The confirmation for the synthesis of the nanoparticles was done by UV–visible analysis followed by characterization of synthesized nanoparticles with XRD, FTIR and SEM techniques. X-ray diffraction analysis showed that nanoparticles exhibited the crystalline nature with wurtzite hexagonal shape and average size was less than 09 nm. FTIR revealed the presence of biomolecules which act as reduction and capping agent for the synthesis of ZnO NPs. Antibacterial activity of the synthesized nanoparticles against four different pathogenic (gram positive and gram negative) strains showed clear zone of inhibitions that confirm the potency of nanoparticles as an antibacterial agent. The present work explored the potential of the callus as bio-reduction material for nanoparticles synthesis. Himalayas are known to be the treasure house of biological and cultural diversity, and regarded as the richest reservoirs of biodiversity in the world. The Indian Himalayas besides having rich diversity of plants which amounts to 8644 plant species  also has a repository of 1748 valuable medicinal plants [29, 67]. The unique diversity of medicinal plants in the Himalayan region is manifested by the presence of a number of native (31%), endemic (15.5%) and threatened elements [48, 57]. The description of these Himalayan medicinal plants can be found in Ayurveda, Unani and other traditional systems of medicine, and in Tibetan system of medicine as well . Almost 90% of medicinal plant species are collected from wild through destructive harvesting, threatening their existence [12, 20, 52]. Viola canescens Wall ex. Roxb. (vernacular—Banafsha; English name—Himalayan white violet; Family—Violaceae) is a popular ethnomedicinal plant throughout Himalayas [1, 50, 51] as the plant is used against almost every ailment either solitary or with some other plant/s. Different parts of the plant are used against common cold and also acts as antipyretic, analgesic and anti-constipating agent , anti-septic , and treat jaundice to cancerous and neurological disorders [23, 31, 39, 51, 55]. This potency of plant is due to the presence of several heterogeneous phytochemicals present in them, which is confirmed by methanolic and ethanolic extracts of plant used for phytochemical profile screening [10, 50]. The plant has been investigated for number of activities and it has been found that solvent extract of Viola canescens has antioxidant, hepatoprotective activity , antibacterial , antifungal  and antimalarial activity . Zinc based nanoparticles showed antimicrobial activities against Staphylococcus aureus and Escherichia coli , Staphylococcus aureus, Streptococcus pneumonia, Klebsiella pneumoniae and Escherichia coli . Nanotechnology is one of the emerging branches of interest in almost all fields’ right from the agriculture to medicine sector. Nanoparticles due to their large surface area, wide gap between valence and conduction band, and high fraction of surface atoms exhibit atom like behaviour [8, 61, 64, 65, 68, 71, 73]. Nanotechnology is based on the manipulation of individual atom or molecule by two different approaches viz. “top down” i.e., by reducing or size reduction of starting material  and “bottom up” i.e., by joining atoms, molecules and tiny particles [21, 42, 45]. These methods are used to produce nanoparticles in the range of 1–100 nm because nanoparticles of this range are in high demand and also at this nano level they show improved characters over their source material [9, 30, 40, 70, 72]. Physical and chemical methods of nanoparticles synthesis required toxic chemicals as capping agents to maintain stability and ultimately lead to environmental toxicity either directly or indirectly. Zinc oxide, a multi-tasking metal oxide, has a unique optical and electrical property. Their nanoparticles are semiconductors that crystallize in either hexagonal wurtzite or cubic zinc blend structure and display significant optical transparency and luminescent properties. Green nanotechnology use “bottom up” method to reduce the material to its nano-size. Green synthesized ZnO nanoparticles (ZnO NPs) are preferred and has drawn worldwide interest due to some of their facilitating properties i.e., biocompatible, biodegradable, less hazardous, non-toxic, eco-friendly and wide range of applicability in different fields as Agriculture, medical, electronic, optic and other material sciences etc. In medicine, ZnO NPs has been reported as more toxic among all other metal based nanoparticles for antimicrobial assay [19, 27, 56]. Further, they are easy, inexpensive, and safe to prepare, even US FDA, considered and enlisted ZnO NPs as “Generally recognized as safe” (GRAS) metal oxides . Due to the eco-friendly nature, cost effectiveness and high utility, green nanotechnology attracts a large section of researchers to think, work and explore different novel methods for the synthesis of green nanoparticles. Green nanotechnology also has biodiversity conservation implications because large amount of herbal material is required for their synthesis which may lead to the extinction of a plant especially those species which are already rare, endangered and threatened as almost 95% of the medicinal plants used by the industries are collected from the forests. As per Balakrishnan et al. presently in India less than 20 plant species are under commercial cultivation whereas over 400 species used for industries production are wild populations. Callus consist a mass of loosely arranged thin walled parenchymatous cells arising from the proliferating cells of the explants. Callus, in plant tissue culture, acts as precursor for the different organs but is also cultured and harvested for secondary metabolites. Medicinal plants offer alternative remedies with tremendous opportunities. Hence an alternative technique to explore the potential of callus or their bio-molecule to act as plant material for green biosynthesis of ZnO NPs was attempted. Number of researcher’s have reported the synthesis of ZnO NPs employing plant as a biological material viz., Aloe barbadensis ; Catharanthus roseus ; Vitex negundo ; Rosa canina ; Laurus nobilis L. . Besides, only few reports are available for callus mediated biosynthesis of nanoparticles, Linum usitatissiumum callus mediated ZnO NPs by Abbasi et al. ; Allophylus serratus callus mediated Silver nanoparticles by Jemal et al. . The present study reports for the first time synthesis, characterization and anti-microbial activity of ZnO NPs using Viola canescens callus extract and Zinc nitrate. Callus induction and plant regeneration is an indirect pathway of plant tissue culture, which involves aseptical culturing of the explant on suitable culture medium to regenerate complete plantlet. Murashige and Skoog medium with 3% Sucrose (w/v) as carbon source and 0.8% Agar (w/v) as gelling agent to solidifie culture medium was used in the present work. To maintain aseptic culture conditions, the culture medium was autoclaved at 121 °C and 15 Pascal pressure. The pH of the medium was adjusted to 5.8 ± 0.2 prior to autoclave. All cultures were maintained at 25 ± 2 °C and 16–8 h, temperature and photoperiod respectively, the humidity of the culture room was maintained at 60–70%. 2,4-D, NAA (auxin) and Kn (cytokinin) were used as growth regulators for callus induction during the present work. Plants of Viola canescens were collected from its natural habitat, i.e., Nag Dev forest range Pauri, Uttarakhand, India without affecting the plants. The explants were rinsed with lukewarm water with 2–3 drops of liquid soap with constant stirring for 10 min, followed by adding 2 drops of Tween-20 and again stirring it for 5 min and finally washed under running tap water for 15 min. Washed explants were diped in 1500 ppm antifungal (Bavistin) solution for 30 min before washing again with the autoclaved distilled water. The surface sterilization of plants was carried out under laminar air chamber, 0.1% mercury chloride solution w/v was used for 90 s and then washed repeatedly with double distilled autoclaved water for 3 times. Sterilized explants were trimmed with the help of scalpel and inoculated in callus inducing medium for calli initiation . Leaf and petiole explants derived calli were served as source of callogenesis during the work. The 40–45 days old Calli were harvested aseptically under laminar air flow chamber for the preparation of extract. Callus extract was prepared by following the methodology of Abbasi et al. with modification. Harvested calli weigh 12 g (fresh weight) and then soaked in 100 ml of double distilled water. The mixture was then heated for 30 min at constant temperature on hot plate at 60 °C followed by incubating the mixture at 40 °C for 24 h before heating the mixture again at 60 °C twice at the interval of 1 h and finally allowed to cool at room temperature. The solution obtained was then filtered with muslin cloth followed by with whatman filter paper twice. The volume of the filtrate was increased to 100 ml with the help of double distilled water. Biosynthesis of Zn nanoparticles was done by mixing 100 ml of callus extract with 100 ml of zinc nitrate extract in 500 ml flask. Prepared plant extract was heated at 60 °C with constant stirring using magnetic stirrer for 10 m before adding ZnO extract in the flask slowly. After complete pouring of the Zn extract in flask having plant extract, the mixture of both solutions was kept for vigorous stirring at 60 °C for 4 h. The change in colour of solution was considered as visual marker for the synthesis of nano particles. Synthesis of nanoparticles was confirmed by UV-visual analysis. Further, the precipitate starts appearing after 3 h of vigorous stirring at 60 °C. Precipitate formed in reaction was allowed to settle at room temperature for 24 h. Supernatant was discarded and crude was centrifuged for 20 min at 5000 rpm, again supernatant were discarded and formed pellets were washed thrice with double distilled water. Finally, pellets were oven dried at 70 °C for 10 h followed by mashing in mortar and pestle to get fine powder and stored in air tight bottles for further characterization and anti-microbial activities. The synthesis of Zinc nanoparticles was confirmed preliminarily by visual observations, including the change of the solution colour from creamy white to light yellow and finally to dark yellow after heating for an hour. where D is an average size of crystallite; β is full width at half maximum of the peak in radians; λ is wavelength of X-ray; θ is Bragg’s angle and K is constant (geometric factor = 0.94). 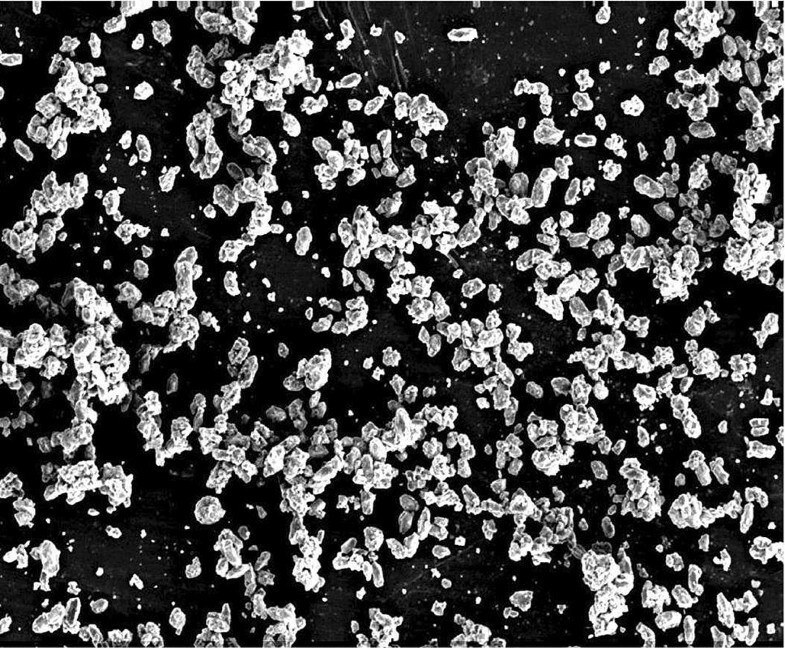 The SEM analysis of the synthesized nanoparticles was carried out by preparing a film of SEM grid by dry powder (sample) on a carbon coated copper grid by dropping simply a very small amount of sample on the grid. The carbon coated copper grids (the films) were then allowed to dry under a mercury lamp and SEM images were recorded at different magnifications. The chemical or biomolecules involved in the bio- reduction and capping of the nanoparticles was analysized by Fourier Transform Infrared Spectroscopy and recorded in the range of 4000–500 cm−1. Synthesized Zinc nanoparticles were subjected to antibacterial assay against four clinically isolated strains viz., Staphylococcus aureus, Streptococcus pneumonia, Klebsiella pneumoniae and Escherichia coli, by Agar well diffusion method. During the work Muller Hinton Agar Medium (HI-Media) was used as culture medium for bacterial assay. The medium was prepared by dissolving 33.9 gm of MHA into 1000 ml of distilled water followed by its autoclaving at 121 °C temperature and 15 Pascal pressure for 15 m. To avoid any contamination, the entire work was carried out under laminar air chamber. All experiments for antibacterial assay were conducted in replicates and data pooled from 3 independent experiments. The effect of different concentrations and treatments was analyzed using one-way analysis of variance (ANOVA), and difference between their means was compared using Duncan’s Multiple Range Test (DMRT), a post hoc test, at P < 0.05. All the analysis was carried out using SPSS 16.0. Callus, the undifferentiated mass of loosely arranged thin walled parenchymatous cells, arising from the proliferating cells of the parent tissue is precursor of different organs in micropropagation. Callus culture of the plant produces the same compound the plant have or more over they have capacity to produce the chemicals at higher rate the plant produces [16, 43]. Callus obtained from an explant of the plant by culturing it on culture media fortified with different plant growth regulators (PGRs). The callus culture provides all weather and continuous sterilized, reliable large scale source of plant material for the synthesis of nanoparticles or for other purposes (production of secondary metabolite, extraction of some useful compounds etc.). The sterilized explants were inoculated on culture medium under control conditions. The inoculated cultures showed calli formation from the cut end of the explants after 8–14 days in maximum concentrations and combinations. MS medium without regulators was used as control and explants showed no calli formation. Similar results were also reported in some other plant species i.e., Psoralea corylefolia , Salvia canariensis  and Dorema ammoniacum . In second set of experiment, MS medium fortified with 2,4-D and NAA. NAA alone cannot induce calli in explants or occasionally swelling followed by no callus formation is reported when medium was fortified with higher concentrations of NAA. While 2,4-D even in lower concentrations start producing calli in both explants with maximum callus induction frequency (43.33 ± 0.50) and (53.33 ± 0.52) for leaf and petiole explants when MS medium was fortified with 6.78 and 13.56 µM 2,4-D, respectively. In third set of experiment, 2-4-D:Kn and NAA:Kn combinations was tried and maximum callus induction frequency (CIF) for leaf explants was 96.67 ± 0.11 when the medium was fortified with 2,4-D:Kn (6.78 + 6.97; 6.78 + 9.30 µM) while for the petiole explants the maximum CIF was 96.67 ± 0.11 when the culture medium was fortified with 9.04 + 9.30 µM 2,4-D:Kn. But when NAA:Kn combinations was tried, maximum average CIF for leaf and petiole explants was observed to be 80.00 ± 0.33; 80.00 ± 0.18 and 86.67 ± 0.30; 86.67 ± 0.18 for 10.74 + 6.97; 10.74 + 9.30 µM and 10.74 + 9.30; 13.42 + 6.97 µM, respectively. Figure 1 and 2, shows the interactions of growth regulators for CIF when combinations of 2,4-D:Kn and NAA:Kn was tried and it was observed that 6.78 µM 2,4-D concentration with different Kn concentrations (2.32–9.30 µM) was proved superior to the other combinations for leaf explant, while 9.04 2,4-D with different Kn concentrations(2.32–9.30 µM) proved superior for petiole explant. Further, in both cases increasing concentration from 2.32 to 9.30 µM showed positive increase in CIF. For NAA 10.74 µM with different concentration of Kn was proved superior than the other concentrations and combination of NAA:Kn for both explants (Fig. 3). In case of calli proliferation, best calli for 2,4-D: Kn combination were seen in 6.78 + 4.64, 6.78 + 6.97, 6.78 + 9.30 and 9.04 + 6.97 µM for leaf explants (Table 1), while for the petiole explants when the medium was fortified with 6.78 + 6.97, 6.78 + 9.30, 9.04 + 6.97, 9.04 + 9.30 and 11.30 + 4.64 µM yielded best callus mass while other combinations tried responded poor to good for callus proliferation (Table 2). In case of NAA:Kn interactions, for callus proliferation no best callus growth was reported, but good callus growth was found when the higher concentration of both growth regulators were tried. Petiole explants responded differently and best calli proliferations were observed only when growth regulators were used at very high concentrations (13.42 + 11.62 and 16.11 + 11.62 µM), while other concentrations responded good to better in other combinations (Tables 3, 4). It was further observed that, 2,4-D showed good proliferation results and intermediate concentrations (among the various concentration tried in present work) responded best, while higher concentration proved inferior for both callus induction and proliferation, the results are in correlation with the work of Malik et al. , Sheeba et al. . The proliferation of calli, with NAA:Kn concentrations was inferior than 2,4-D:Kn similar to Bhandari  and Bisht . The generated calli were then maintained on the same culture medium and harvested after 5–6 weeks. X-ray diffraction technique for studying crystal structure is based on discovery of Laue  that crystalline substances act as a three dimensional diffraction grating for X-ray wavelength . X-ray diffraction is an important versatile, non-destructive analytical method used for identification and quantitative determination of various crystalline forms of solids, including lattice constant and geometry. An interaction of a particular crystalline solid with X-rays helps in investigating its actual structure. The XRD spectrometric analysis of in vitro callus based synthesis of nanoparticles using Zinc nitrate hexahydarate as precursor of Zn ions (Fig. 4), showed distinctive peaks at 32.031, 33.480, 34.690, 36,516, 47.788, 56.819 and 63.06, which corresponds to lattice plane of 100, 107, 002, 101, 102, 110 and 103, respectively and confirms the crystallinity with hexagonal structure of synthesized nanoparticle. The average calculated size of ZnO NPs were obtained from most prominent XRD peaks by using Deby- Scherrer’s equation and was recorded to be < 9 nm (Table 5). 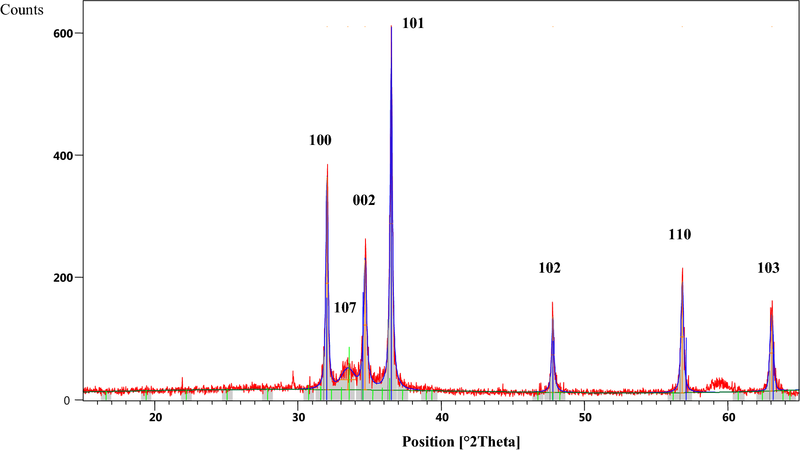 A few unassigned peaks were also observed which may be due to the presence of some bioorganic compounds/protein(s) in the callus extracts and crystallizes on the surface of zinc, similar finding was also reported by Ahmad & Sharma , during their study they reported the unassigned peaks in the XRD spectra which might be due to the crystallization of proteins or other biomolecules on the surface of silver from the leaf extract of Ananas comosus . Further, similar results were also reported for silver nanoparticles synthesized by using Geranium leaves , Mangifera indica leaf extract  and Coleus aromaticus leaf extract . FTIR is performed to determine the different functional groups present in the sample, because absorption results in the change in vibrational and rotational state of molecular bonds and different functional groups absorb characteristic frequencies of infrared radiations. Thus, producing spectra with different peaks, which corresponds to frequency of vibration between the bonds of atoms that makes the molecule, providing unique characteristic of the functional groups that make up the molecules and of the overall configuration of the molecule. FTIR spectra obtained from the powder sample of the synthesized nanoparticles showed number of peaks (Fig. 5) which corresponds to hydroxyl group (3421.34 cm−1), 2419.33 cm−1 peak which is attributing phosphin, further peaks at 2140.10 cm−1, 1648.03 cm−1, 1555.80 cm−1, 1384.10 cm−1 and 1056.46 cm−1 which again corresponds to C≡C, C=C, C=O and C-O, respectively. Besides, band at 545.65 attributed to ZnO hexagonal structure. Hence, from the results of FTIR, it is confirmed that some biomolecules form the callus extract such as phenols, alkaloids, flavonoids and other biomolecules served as fuel for the bio-reduction and capping of ZnO to its nano-size or ZnO NPs (Fig. 6). SEM is a type of microscopy that produces high resolution images of sample surface by using focused beam of high energy electrons. Thus specimen was exposed to beam of electron which moved over and scan the surface of the specimen. SEM analysis for morphological studies was carried out on prepared films grids and the micrographs were obtained at different magnifications i.e., 900 × to 6000 × at 10–15 kv. Biosynthesized ZnO NPs were rod shaped in morphology, moreover boundaries between each particle can be observed easily (Fig. 7). Further, morphology of nanoparticles appeared nearly hexagonal in shape which is in accordance with the XRD results. Nanoparticles shows enhanced anti-bacterial activity in comparison to their bulky cousins, which might be attributed to large surface area over volume. Agar well diffusion method was used to evaluate the bactericidal activity of synthesized nanoparticles against 2 gram positive (Streptococcus pneumoniae and Staphylococcus aureus) and 2 gram negative (Klebsiella pneumoniae and E. coli) bacteria. During assay sodium chloride solution was used as positive control and Amoxicillin was used as the drug, for the comparative response. Synthesized ZnO NPs showed antimicrobial potential against all test organisms. 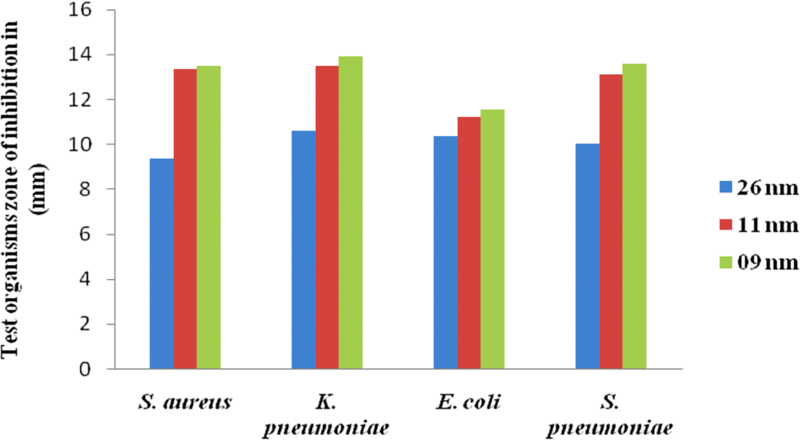 The maximum zone of inhibition was reported in Klebsiella pneumoniae (13.90 ± 0.17 mm) when 100 µg ZnO nanoparticles were put in the well and minimum zone of inhibition was reported in E. coli (11.53 ± 0.38) for 100 µg concentration (Table 6). Similar results were reported by Senthilkumar and Sivakumar  and Jemal et al. . In the present work, the possible mechanism involved in the antibacterial activity of nanoparticles was thought to be production of reactive oxygen species (ROS) (Fig. 8). In culture medium small sized nanoparticles accumulate on the surface of bacteria, which then absorbed on the surface. 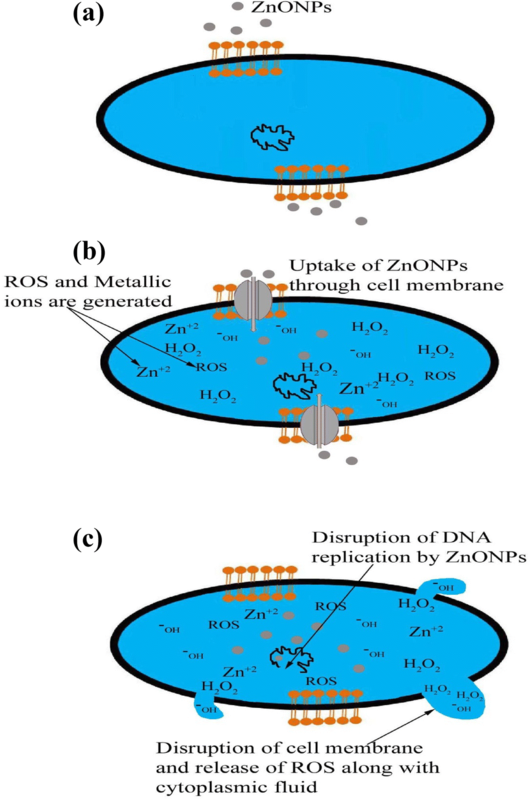 Direct contact of ZnO NPs with the cell membrane results in the destruction of bacterial cell integrity [3, 15, 69, 78]. After reaching inside the cell ZnO NPs activated and produce ROS such as hydroxyl radicals, superoxides and hydrogen peroxide (H2O2) [37, 59, 77]. Since negatively charged radicals cannot enter into the cell membrane of host, only hydrogen peroxide, a strong oxidizing agent can enter the cell membrane. After entering in the host cell it produces free radicals which interrupt the metabolism of host cell and several times damage the DNA or the cell membrane which ultimately results in the death of the organism (Fig. 8). Statistical analysis for the amount of nanoparticles dependent bactericidal activity showed significant variation by DMRT at 0.5% and maximum zone of inhibition attributed to high concentration of nanoparticles, and among different bacteria maximum zone of inhibition was reported for K. pneumoniae while least value for E. coli. Further in comparison to drug based zone of inhibition, present synthesized nanoparticles proved best over conventional drug for S. aureas. Antibacterial activity of synthesized nanoparticles mainly depend on their size and ROS is major cause of nanotoxicity [17, 24, 36, 46, 76, 79], the present finding confirm the same because leaf (26 nm) and root (11 nm) based nanoparticle proved inferior in comparison to callus based nanoparticles [31, 33] (Fig. 9). The present work explored the alternative pathway for the nanoparticles synthesis, which involves the synthesis of nanoparticles using the callus of the plant in place of using the organs of the plant (leaves, roots, whole plant etc.). This alternate pathway reduces the burden on the biodiversity because as per existing methodology huge amount of the plant material is required for the synthesis of metallic nanoparticles. So, nanoparticles of critically endangered or rare, endangered and threatened (RET) species of high medicinal value may be achieved by this improved methodology. Moreover, the availability of plant material is throughout the year under lab conditions through callus. The callus extract of the V. canescens showed the potency for the bio-reduction and capping of the ZnO NPs. The green method proved cost effective and safe practice over the chemical and physical synthesis of the nanoparticles. The XRD investigation suggested hexagonal structure with less than 9 nm average size of nanoparticles. The synthesized nanoparticles depicted good anti-microbial activity and showed clear zone of inhibition against all tested bacteria. Thus, present protocol may be used for the synthesis of nanoparticles using callus of other plants especially RET species. The authors are highly thankful to USIC department of HNB Garhwal University and Punjab University Chandigarh for their help during characterization of ZnO NPs and to Dr. V. Maurya for assistance in the antimicrobial aspect of the work.